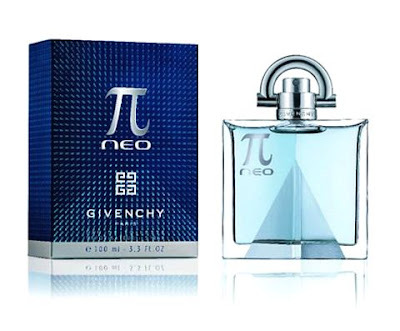 I'm a little annoyed at myself for never having written about Givenchy's Pi (except in passing), because it would be a lot easier to talk about their newest men's offering, Pi Neo, by comparing it to the original. I'll just have to do it backwards, then, without any reference to the original, and get to Pi one of these days. Pi Neo is a very silly name for a fragrance, for two reasons. First, the "Neo" part of it is an explicit reference to "The Matrix", and if you want to seem modern, even futuristic, what better way than by naming your scent after a character in a movie that's almost a decade old? Second, "Pi Neo" sounds as if it should be a floor cleaner with a cartoon character for a spokesperson: "Piney-O!" The marketers are making the scent sound as forward-thinking as possible by bragging about the synthetics used in its composition, too. The sample packaging (a dribbly, annoying 1-mL foil envelope) says the scent family is "fusing woody" (more silliness) and consists of "Toscanol--aniseeed flash, Cedarwood fraction Texas, Patchouli fraction Indonesia, Vanillian extracted from Benzoin Siam", which makes it sound like something that came out of an oil refinery. The promotional material mentions the synthetics Toscanol, Safraleine, and Cosmone, which sound like nothing on Earth. Okay, that's out of the way. What does it smell like? Pretty good, surprisingly. The body of the scent is warm and cozy with a slightly metallic undertone. The synethic odorant Safraleine is supposed to "[exhibit] warm, powerful, leathery and tobacco facets but its complexity also reveals characteristics of spices reminiscent of natural saffron, enriched by rose ketone-like floral aspects": good luck finding all that in there. It doesn't smell like saffron, at least not at this concentration, and in fact it doesn't smell like anything I can put my finger on, not roses, not leather or tobacco; it mostly smells indefinably warm and woody, and that's not a bad thing to smell like. There's already a typical vanilla-amber undertone to the middle (although much less sweet than usual, because it's cut through by the light but persistent synthetic-metallic-fresh aspect), underscoring the warmth, and that only increases as the scent begins its descent into the base notes. The patchouli isn't strong: you'd never call this a patchouli scent. You'd also never call Pi Neo wildly original or a must-have, but over the course of its life on the skin it's better, certainly more interesting, than most mass-market scents out there. I was watching some old episodes of Law & Order tonight, from season 9, and in one of them, episode 6 or 7, Lennie Briscoe, one of the detectives, looks into a display case of guns, points to one of them, and says, "A .357." And I wondered, "How does he know that? ", because to me, all guns look alike; they're just guns. But in episode 2, a character picks up a bottle of perfume and sets in on a counter, and I thought, "Hey, I think that's X'ia X'iang." I'm not obsessive enough to go back and frame-by-frame it to make sure, but I'm pretty sure it was Revlon's long-discontinued X'ia X'iang (which was launched in 1987 and can still be had for large sums of money on the Internet). Bet Briscoe couldn't have done that! Some people can tell the make and year of a car just from seeing the back bumper. Some people can name a building's architect after seeing the dome of a church or the sweep of a flying buttress. I may not be able to do anything quite so grand, but I can identify hundreds and hundreds of different fragrance bottles on sight, and so, I bet, can a lot of my fellow perfume-hounds. Here's a piece about perverse modern fragrances. I'm not really buying the piece's main conceit, which is that, as the headline reads, "cutting-edge fragrances tell stories", since most well-constructed scents have a story to tell, but it's an interesting piece nonetheless. My own attack of product-separation anxiety was triggered by the disappearance of Helmut Lang Cuiron Pour Homme cologne. Just months after I co-opted the meant-for-men scent from my husband, the label decided to get out of the fragrance business. Once I finished our one and only vial, I took to wandering longingly past the now shuttered Lang perfume store on Greene Street in New York’s SoHo, remembering a time when the shop brimmed with bottles of the leathery elixir. Finally, I discovered that a few shady-sounding online retailers with names like Perfumes 4 U still stocked the juice, and I loaded up. I have four bottles left, enabling me to accept my fragrance fate slowly. Sniffing and swooning their way around the world's most elite fragrance boutiques or scouring eBay for half-finished bottles of rare, highly prized scents such as Chypre by Coty or Nombre Noir by Shiseido, the perfumistas amass fragrances in the way that other women collect shoes. Note to that Daily Mail scribe: they're not all women. 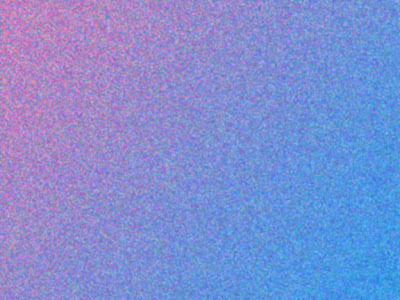 A gradient, as you probably know, is a smooth blend from one colour to another, possibly with other colours in between. 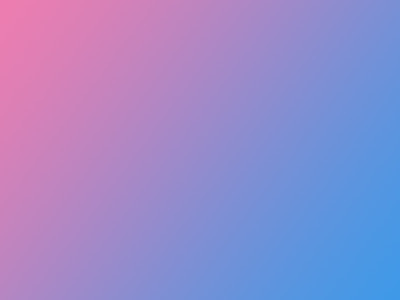 Here's a gradient from pink to blue. 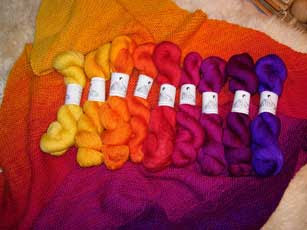 which is actual knitting done with this method. I mention this because Lancôme's new scent, Magnifique, is the most knitting-gradiented scent I have ever smelled, ticking methodically through its changes, each new element of the scent showing up before the previous one has vanished and gradually supplanting it, everything appearing and fading out in a sort of cadence. It's a remarkable effect, beautifully choreographed. The opening is bright and cheerful, a citrusy little shimmer. Soon the middle notes begin to slide into view, a slightly spiced rose. The rose-saffron accord bears a superficial resemblance to L'Artisan's Safran Troublant, but with the emphases reversed: a huge quantity of rose with just a little fillip of saffron which peeks out from time to time. Magnifique has two rosy elements working hand in hand; a fresh petally rose (like that in Safran Troublant) and a pleasantly sugary rose that seems like rose jam, or raspberry jam with rose petals cooked into it. It's not godawful sweet like so many women's scents nowadays; it's not a fruity floral. Instead, the sugar is laid on with a steady hand, and it's just enough to warm up the whole composition. An hour or so in, the bottom of the scent begins to sidle up, and it's wood; specifically, sandalwood plus an Indian plant called nagarmota, which has a dry, papery overtone which calls to mind CSP's Bois de Filao, a little. (There's also supposedly vetiver; it's subtle.) The fresh sweet rose begins to darken, and the scent gradually gets darker and more sombre. Maybe six hours in, what's left of Magnifique on the skin is a deep, resonant wood with just a little undercurrent of that rose, and that's how it stays until it eventually fades out altogether. It's a real pleasure to see a mainstream company risking the launch of something which doesn't simply follow any of the current trends for perfumery. 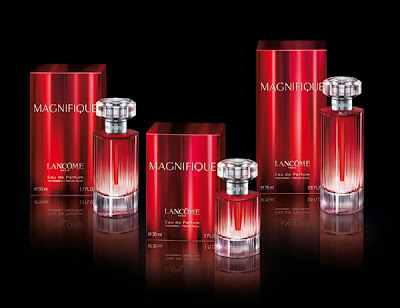 Magnifique isn't wildly complex, isn't difficult to understand and love; it's not a niche scent at all. But it's something of a novelty, and a very successful one at that. The bottle is neither good nor bad; it's a bottle, that's all. (I like the shimmery box better.) The name, however, is wrong for the contents. A scent called "Magnifique" ought to be big and imposing, a grande-dame scent of the kind that nobody makes any more. It ought to be magnificent. Instead, Magnifique is youthful, interesting, pretty without being precious, a refreshing change of pace from the hundreds of cookie-cutter women's scents of the past decade. This picture is swiped from Project Rungay, which you ought to be reading all the time, even if you don't watch Project Runway, the show it's all about (and if you don't, why don't you?). It's from Michael Kors' new clothing collection. 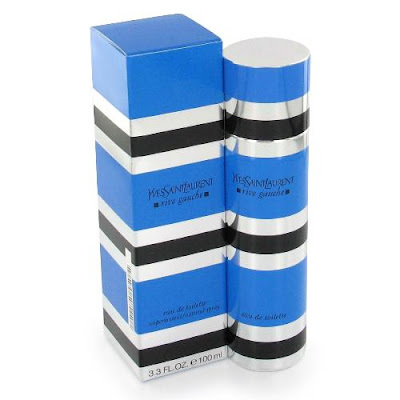 The second I saw that garment, I thought, "Yves Saint Laurent Rive Gauche eau de toilette". See? The blue is not quite the same and the emphasis is reversed, but it's still the same design. He has turned the model into a walking, breathing perfume bottle, and it's not even his own perfume. Did nobody in Kors' entire galaxy of assistants and hangers-on notice this? 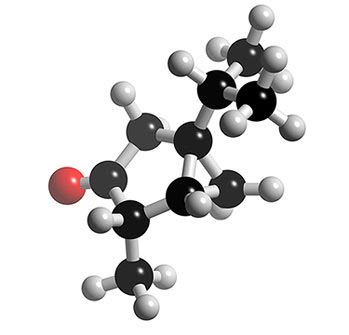 This elegant creature is thujone, the molecule supposedly responsible for the deleterious effects of absinthe, which I've put here for no other reason than that I liked the look of it. Way back in May you reviewed Perfumes: The Guide and mentioned that one of its major failings was the lack of an index, a shortcoming mentioned in every write-up I saw. One of their readers did something about it. If you head over to http://perfumestheguide.com and poke around, you'll find not only an Excel-spreadsheet-format index (on the "Corrections" page), but also a quarterly newsletter with 16 pages of new reviews. I hadn't heard about it until today, so I thought I'd mention it in case you've been similarly out of the loop. I had heard about it, but somehow neglected to mention it. Thanks! This is a mosquito beating its wings against an elephant and fancying the beast can feel the breeze, but I have to say that the bloom is off the rose for me regarding "Perfumes: The Guide", particularly since I read that update. It's true that Luca Turin and Tania Sanchez have a fun writing style and that they often have something interesting to say about fragrances; they're deep inside the industry and they give us information that nobody else does, and for that I'm thankful. The problem for me is that, like The New Yorker's Anthony Lane in his movie reviews, they sometimes seem to value the effect of what they're writing over the literal truth of it, which is to say that sometimes it seems they write the material first and only then apply it to the nearest fragrance. I'm not talking about merely disagreeing with their opinions; that's always going to happen when writing about something as intensely subjective and personal as fragrance. I'm talking about writing things that actually seem to be wrong, or astoundingly misguided. Turin and Sanchez can give four stars to Baldessarini by Hugo Boss or Salvador Dali Laguna (which I despise so much I can't even write about it); fine. They like them, I don't. But sometimes they'll write something that makes me think, "Did you even smell it and think about it, or did you just read about it?" And I hate to think that, because it's just a cheap tactic that disgruntled authors use against bad reviews ("I don't know what book your reviewer was reading, but it clearly wasn't mine", or "Did your reviewer even read my book? ", they will querulously begin). And I don't even have a personal stake in the fragrance in question! But when I write about scent, I take a long time to think about exactly what a particular fragrance means to me (which is why I went down to one review a week), and it bothers me to see a review that appears to be dashed-off and even incorrect. Last week I wrote about Lexington Avenue. The Guide's two-word description is "almond nailpolish", which is silly, because the almond-marzipan note isn't a dominant characteristic of the scent and if there's a nail-varnish element, I didn't find it. They might as well have called it "fennel shoepolish" for all the good that would have done as a descriptor. Worse, Turin calls it, in part, a "screechy peony floral", which just doesn't sit right with me for a number of reasons, primarily that the scent isn't screechy at all; a peony naturally has a sharp characteristic which comes through in Lexington Avenue, but the scent itself isn't harsh in any way. Worst of all, from the point of view of an editor rather than a fragrance junkie, is the fact that yet again he uses the word "screechy", which is second only to his/their use of the word "hissy". I'm not going to comb through the entire book to count the number of uses of "hissy", but in the update, which covers 100 scents, it's used four times. The book is said to cover 1500 scents, and if that ratio holds true, then the word could well appear sixty times, which wouldn't surprise me at all and is far too many. I know that writing about scent is hard, but Turin and Sanchez need a bigger vocabulary or a more insistent editor. Here's a Salon.com article that readers may be interested in, about the use of fragrance in marketing. There isn't anything in it that's new, but at least it's all in one place. The article is sloppily composed and not altogether accurate, though: the sentence "Halifax, Nova Scotia, has declared itself a completely fragrance-free city" is nonsense on the face of it, because you can still buy fragrances there, as you can anywhere, and in any event it would be impossible to make any place on Earth "fragrance-free", considering the broader definition of "fragrance". Halifax did enforce at least one law nearly a decade ago declaring various public places to be scent-free zones, which got a lot of international media attention, and sales of perfumes actually did decline there, but it's no more fragrance-free than anywhere else. I was in Halifax last fall and I can testify to that. Mills Brothers, a high-end downtown clothing and cosmetic boutique, had been completely revamped, with a fragrance department carrying such sort-of-niche lines as L'Artisan Parfumeur and Annick Goutal. I bought a bottle of Mugler's Pure Coffee at The Bay, which had a fragrance department as big and diverse as ever. In short, not a scent-free city by any possible definition of the word. Given the number of times I've knocked Salon on my other blog for its apparent lack of editorial oversight, this sort of inaccuracy is par for the course. I had a mildly strange experience at a department store this past weekend. On Friday I'd popped into The Bay (a Canadian chain of stores formerly known as the Hudson's Bay Company, one of the world's oldest commercial enterprises) to get a couple of samples, if they were available, which, as you probably know, they rarely are. I couldn't find anybody to ask, because, like most retail stores nowadays, The Bay is grievously understaffed, so I just kind of nosed around, peering behind the shiny counter displays which are a favourite hiding place for samples of new fragrances. Success! There was a poorly hidden bowl of samples of the new Estee Lauder, Sensuous, so I grabbed one (but only one--I'm not greedy) without feeling any guilt; they may try to hide them, but if they're on the counter and they're free, then I'm having one. Noodling over to the men's department, I noticed the display for the new Givenchy, Pi Neo, and to the left of that, three identical small cardboard boxes which seemed like a good bet to contain samples, which, according to the text on the top of each box, is just what they were. Since there were still no salespeople in evidence, I opened one of the boxes, snagged a couple of the foil envelopes (an inferior way of distributing samples, Givenchy), and was on my way. On Sunday I was back at The Bay on a pants-finding mission, and while at the checkout (for the mission was a success), I noticed a huge banner for the new Lancome scent, Magnifique. I motored over to the Lancome counter, and that is where the strangeness started. On the counter were two bowls full of samples. I picked one of the cardboard sleeves up, and...it was empty. I picked up another and another; all empty. I went over to the other bowl; eight or ten cardboard sleeves, all empty. Huh, I thought; people are just grabbing the little spray vials and leaving the packaging behind! I figured it might well have been one person who emptied them all out, spiriting away twenty or so vials, a whole one-ounce bottle's worth; I wouldn't put it past some piggy customer to do that. (It's not as if there'd likely be a salesperson around to stop them.) I patiently waited for the saleswoman to finish her conversation with the Clinique rep and make her way over to me. "These are all empty!" I said, gesturing to the sleeves. "Yes. If we leave them there, customers just take them, and we don't have a chance to do a consultation with them and discuss the scent," the saleswoman said. I put off processing this until later and just asked if she had a sample I could have. "It's the new women's scent from Lancome," she said, heading for the sample drawer while simultaneously trying to make sure I wasn't stupid enough to think that this might actually be a men's scent, what with the bright red colour and the picture of Anne Hathaway and the fact that it was in the women's fragrance department. I don't know why I should have to defend myself, but I said, "Yeah, I know, but I have to try everything that comes down the pike." Picking up the tester and sniffing it, I said, "Roses. Very nice!" in an effort to assuage her apparent discomfort. "Yes, it is lovely, isn't is?" she said as she handed me the sample. I thanked her and went on my way. On the way out, I noticed that the bowl of testers for Sensuous was on the Estee Lauder counter, and a quick check confirmed that all of these expensively printed card-stock folders were also empty. To recap: someone at the company has decided that they should take all the samples, remove the actual sample part from them, and display the evidence thats samples exist, thereby demonstrating that they don't trust their own customers. They might well be right not to trust them, but to prove it? 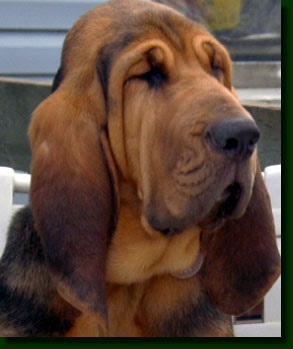 What on Earth does that accomplish other than making them look suspicious and small? You know what would be a better idea? Nice little signs on the counters next to the display units reading "Now Sampling This Fragrance". It would alert customers that there was a freebie to be had (because surprisingly many people don't know that you can just ask for such a thing) while simultaneously ensuring that the salespeople get to talk up the fragrance. (They could then take down the sign when all the samples for that product were gone, thereby alerting people that they shouldn't waste their time waiting for a nonexistent sample.) But to tease a customer with the prospect of a sample and then pluck it away, while simultaneously confusing them and making them feel untrustworthy; well, what kind of a way is that for a commercial enterprise to generate goodwill? There are two things I don't get about Lexington Avenue, Bond No. 9's latest scent and third in their Andy Warhol series. The first is the shoe motif, though I understand the idea behind it. At the start of his career, Andy Warhol lived on 242 Lexington Avenue and made his living doing commercial illustrations, particularly of footwear; he even illustrated a little book of poems called "A La Récherche du Shoes Perdu". Warhol's fascination with shoes makes it a natural fit for Bond No. 9's Warhol scent, but I'm sufficiently literal-minded that if I think of a fragrance associated with shoes, then I'm going to think of the smell of leather. There isn't any leather in Lexington Avenue, to say the least; it's a floral-gourmand scent, and the darkest thing in it is the patchouli in the base. For the last few years, perfumers and fragrance manufacturers have been trying to redefine the chypre scent to get around this restriction on the use of oakmoss. The original Miss Dior, for instance, was an honest-to-god chypre; the company launched Miss Dior Chérie a few years ago and positioned it as a "new chypre", which meant that it had a lot of patchouli in the base, and that (or a lot of vetiver, or both) seems to be the new benchmark for what a chypre is. It doesn't make any sense to me; it's like saying something's a floral and then not putting any floral notes in it, but instead using mint leaves and saying that's the calling card of the "new floral". I have Estee Lauder's Knowing and Boucheron Pour Homme in the original formulations and they're serious chypres, laden from top to bottom with the earthy-honey glow of oakmoss; I know what a chypre is, and Lexington Avenue (alongside so many other so-called chypres of the last few years) really isn't one. What Lex Ave is, however, is heaven. It's as if they interviewed me behind my own back and concocted something they knew I'd find irresistible. 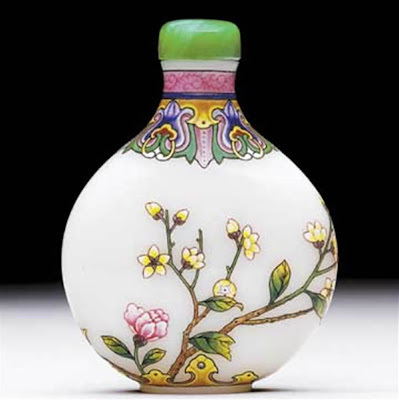 It has suggestions of other gourmand orientals, such as Todd Oldham, L Lempicka, and Byblos Cielo, but it's not saturated in vanilla, the usual keynote of the gourmand scent, instead going off in an entirely different direction. The top note seems to me to have a green-pineapple smell to it, a bright berry scent (because a pineapple is botanically a collection of berries under a single skin) fused with a bit of tropical greenery, just what you get when you smell the top of a not-quite-ripe pineapple. I Googled some other reviews and nobody else seems to have noticed or mentioned this, so maybe my nose is just weird, but I don't care. It's what I smell, and it's lovely. The middle slides into view as a slightly sharp peony cosseted by a warm patisserie aroma that is, apparently, crême brulée; it doesn't smell quite that specific to me, just a caramelized-sugar scent with a bit of vanilla in it. Flower-filled vanilla custard with a sugar crust doesn't sound as if it should smell any better than it would taste, but it's delicious. After this starts to burn away, and it takes hours, the woody-patchouli base takes over, and it's that cleaned-up patchouli that everyone uses nowadays; no complaints from me, because it's very appealing. The whole thing stays close to the skin throughout its eight- to ten-hour life; it's not radiant or overwhelming (though I guess like any scent it could be if you really doused yourself), preferring to beckon rather than broadcast. When Bond No. 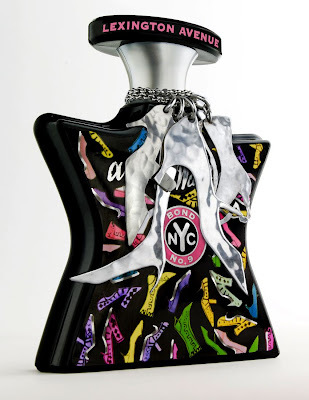 9's first Andy Warhol scent, Silver Factory, was launched, the intention was to create a series of unisex fragrances: "Like all the scents-in-progress that we are designing for our Warhol repertory, this one is of ambiguous male-female gender." They must have discarded that idea at some point, because it would be very hard to call Lexington Avenue ambiguous in any way: it's clearly aimed at women. The scent itself, while not classically feminine, would probably not announce itself to many men as a masculine scent; the floral heart and the sweet gourmanderie are going to be read by many people as a women's fragrance. It's not decidedly feminine, mind you: I can wear it (and what's more, wear it to work) without feeling like some kind of olfactory transvestite. It's just not going to strike most people as a men's scent, or even a unisex one. I sure don't care: it smells good, and I like to smell good. The company couldn't make it more obvious that they've ditched the ambiguity; they even say that the scent is meant "to link two of the most ultra-feminine commodities a woman can own; fragrance and footwear." Whatever. I don't care a lick about shoes, but I know a good scent when I smell one, and Lexington Avenue is one of the best things I've smelled all year. I'm of two minds about knowing lists of perfume ingredients before you even try the scent. On the one hand, it's easier to guess if it's something you ought to seek out and sample before buying, because you can often get a good idea as to how it's going to smell. It's also nice to know exactly what it is that makes up what you're smelling, because it helps you refine your nose. On the other hand, though, the list of notes, particularly in commercial perfumery, is always incomplete and often misleading, especially with the enormous number of aromachemicals now available to the perfumer; "frozen apple accord" is not a useful descriptor, in my opinion. 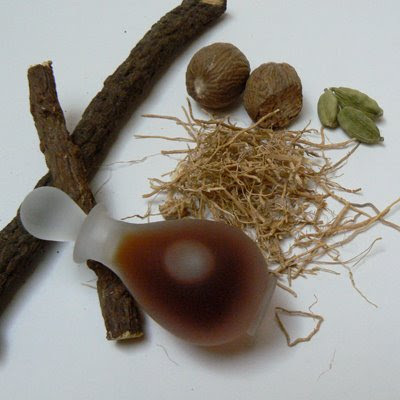 Worse, when you know what's supposed to be in a scent, you have a way of convincing yourself that that's what you're smelling, for better or for worse; if the base is mostly Javanol, a synthetic, but the notes list the bit player sandalwood, you can end up saying to yourself, "That woody smell must be sandalwood. So that's what sandalwood smells like!" When I learned I was going to be receiving a sample of the summer limited-edition Ayala Moriel perfume Vetiver Racinettes, I decided to read as little as possible about it. When you read as many websites and perfume blogs as I do, it's hard to avoid hearing at least something about what you're going to be wearing, but I wanted to go in as fresh as possible. In my (admittedly not extensive) experience with natural perfumery, I have noticed that complex formulae often smell a little murky; a simple soliflore or a citrus-herbal scent can smell very clean and pure, but when there are a dozen or more ingredients, there always seem to be qualities in some of the notes that blur and obscure the shape of the scent. Synthetics seem to have the ability to carve out little domains within the fragrance, to refine and brighten various facets, to put this quality or that of the perfume into sharp relief, in a way that I have not yet encountered in an all-natural composed perfume. This is my way of saying that I find Vetiver Racinettes somewhat muddy, particularly in the opening, where I would expect it to be much sharper. The top notes--of course I had to look them up!--are black pepper, ginger, cardamom, and lime leaf, but where I would have expected to find a sort of dazzle was more of a dark cloud. And yet it is very beautiful for all that. The vetiver wells up quickly and takes over, bringing that paradoxical bright/earthy scent that I love. It's not just vetiver; there are pools and eddies of warmth and darkness with a slightly dirty edge (and I mean, of course, "dirty" in the approving perfumery sense of "complex and not prissily cleaned up" rather than the more conventional one). It's a strong scent, but not an overwhelming one: it has a lot of presence. In the late stages of the scent, before I knew what was in there, I was puzzled, and pleased, to discover a sort of loamy-mushroom scent entwined with the vetiver root. "Mushrooms?" I thought, and sure enough, one of the ingredients in the base is cepes, which is to say porcini. There's probably no better way to evoke the idea of the underground that by pairing vetiver--and not just one kind, but various vetivers with their various qualities--and mushrooms. I was quite sure my perfume-mad co-worker was going to adore Vetiver Racinettes. She's planning to order Andy Tauer's Incense Rose, which I knew she would love before I even let her try it, and I thought that a dense, chthonic perfume like Vetiver Racinettes could have been custom-made for her. But a baffling thing happened: she tried it on and wore it for an hour and a half or so, and it just didn't work. I was wearing it that day as well, and we sniffed her skin and then mine, and we agreed that for some reason, it smelled very, very good on me and...seriously, not so good on her. It might almost have been another scent. I don't necessarily place a huge amount of credence in the notion that skin chemistry makes or breaks a fragrance, but this was a dramatic difference. Was it our diet (she's a vegetarian)? Whatever fragrance she'd worn earlier that day? The phase of the moon? So she didn't like it. But I did, and if you like dark vetivers, you ought to consider getting yourself some before it's too late, because it's the sort of thing that, on the right person, could easily be a signature scent: rare, distinctive, and original.